Silver Spoon Trails is a 18.6 mile point-to-point trail located near Deep River, Ontario that features a river. The trail is rated as moderate and primarily used for road biking & walking. Visitors are welcome to use our facilities. Before you use the Silver Spoon Trails, please sign the waiver form either on the Four Seasons sign, or inside the chalet on Balmer Bay Road. In the winter, please also consider a donation towards the maintenance of the chalet and the grooming of the trails. A donation box is available inside the chalet. The club maintains three trail networks and is a partner in a fourth one. The Silver Spoon Trails are the closest to downtown Deep River. They are located on either side of the Balmer Bay Road just past the hospital. Convenient starting points are the plowed area north of the road adjacent to the hospital, or at the club chalet. There are about 30 km of trail, of which 20 are groomed and track-set. The trails on the river side of the road are gentle. Those on the other side are more challenging. Trails labelled M, S, H and B are groomed for both classic and ski skating techniques. The Fun-loop is only for the truly adventuresome, and the P-loop is a challenging backcountry trail. The Cabin Trails are a network of 50 km of ungroomed wilderness trails that lead out to our cabin near the border of Algonquin Park. The starting point is at the end of Bass Lake Road, which turns West off Hwy 17 just before Point Alexander, 4 km north of Deep River. The Forestry Trail System is based at the Petawawa Research Forest 5 km south of Chalk River. Turn West from Hwy 17 onto Clouthier Road and follow it to a gate. Parking is 100 m before the gate, to your right. There are currently 19 km of ungroomed wilderness trails. 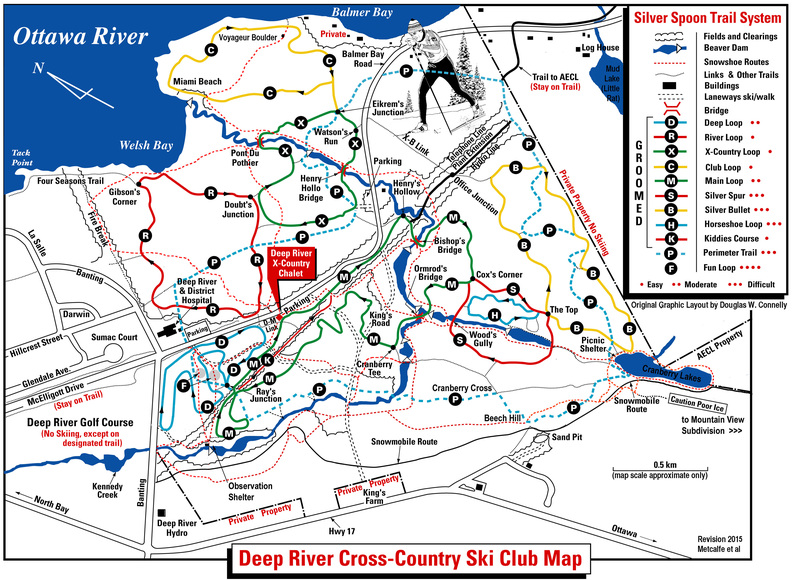 The Plant Trail System connects the Silver Spoon Trails to AECL’s Chalk River Laboratories and is used to ski to and from work. Only AECL employees carrying appropriate identification are permitted on these trails.